In the following tutorial you will learn how to choose between the ICP and MULTI ICP algorithms available in Zephyr. This is the first part of three tutorial on the subject. In this tutorial you will find a generic overview of registration and for each registration phases. Every section below will have a link to a specific tutorial that allows you to complete that phase. if you need to register point sets with different scales, it is advisable to use the two view ICP dialog and enable scaling. 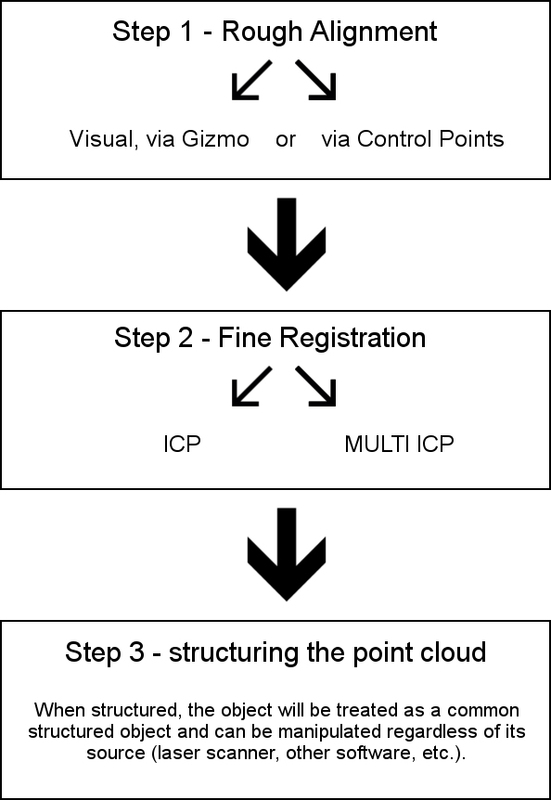 Both case scenario can be solved with a similar workflow, although there are some differences in the process : if needed roughly pre-align the point clouds (step 1), then execute the fine registration (step 2), and finally structure the point cloud (step 3). When dealing with a photogrammetry point cloud and an external point cloud, you shall use the “Point Cloud Registration (ICP)” command from the “Tools” -> “Registration” Menu. This function considers translation, rotation and scale. 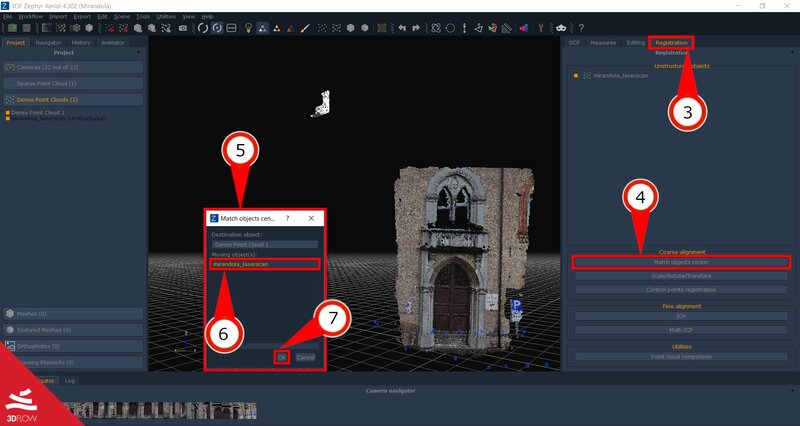 Using this function you can then align a laser scanned point cloud which can then later, for example, be structured and colored with the photogrammetry obtained point cloud. 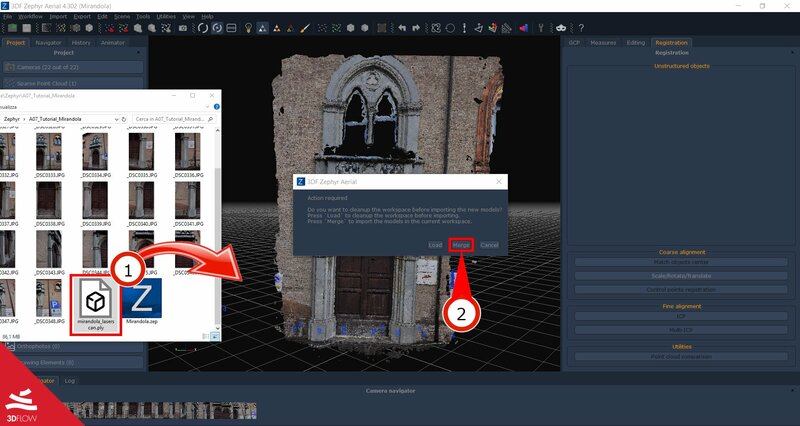 When dealing with multiple external, unstructured point clouds, you shall use the “Multiview point cloud bundle adjustment (Multi ICP)” command from the “Tools” -> “Registration” Menu. 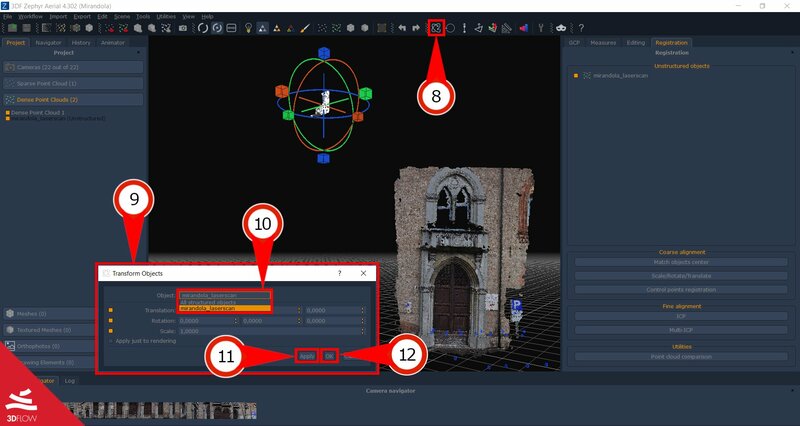 Use this function when dealing with many point clouds that are already in the correct scale system, for example multiple scans from a laser scanner device. This function does not apply any scale factor. Following this workflow allows you to merge photogrammetry and laser scan objects. Start opening .Zep file with dense point cloud then drag and drop laser scan file (.ply) (1) into the workspace. Then select “Merge” (2) at window appeared. This allows you to load laser scan object into already opened photogrammetry workspace. Please note that sometimes, the imported object can be positioned to very far coordinates: if you don’t immediately see the imported object, try to move the workspace camera until you see the subject.Or simply use the “use object centre” function. In order to do this, open the panel “Registration” (3) and click on “Match Object center” (4). The “Match Object Center” (5) window will appear. Select the “Destination object” and the “Moving object” (in this example we chose as “moving object” the laser scan (6)) and then press “Ok” (7) to move forward. When using the gizmo, it’s advisable to enable all the desired items with their appropriate checkbox, for better workspace browsing. You may pick which object has to be moved from the dropdown box “Object” (10). When you are happy with your modification to remember to press “Apply” (11) before exiting Gizmo tool or before changing Object. Press “Ok” (12) button to move forward. When dealing with very noise photogrammetry point cloud or excessively planar surfaces (building facades), you may want to use control points prior to the ICP alignment. In this case, the alignment via control point takes just a few clicks and can vastly improve the results. – Tutorial : Rough alignment, Gizmo and control points. The ICP function (Iterative Closest Point) is an algorithm employed to minimize the difference between two point clouds. This is the preferred method when you are dealing with different scale factors. Simply select the desired dense point cloud from the “Project” Tab, right click it and then click “Make structured”. Select the options accordingly to your needs (such as compute normals and compute colors) and click OK. You’re done! (You may also unstructured any structured object at any time, by selecting “Make unstructured”). The next tutorial will show how to generate contour lines and sections. Proceed to the next tutorial.